My free summer edition Kraft Food and Family magazine arrived, and I was thrilled to see that the focus is on outdoor cooking. "Kick Back and Relax--50+ Recipes for Grilling and Chilling" is stretched right across the cover. This issue has loads of ideas for the grill including some of my favorites like steak and corn on the cob. There are also some delicious looking side dishes. I've got my eye on the Light Lime Chiffon Pie. That looks great. 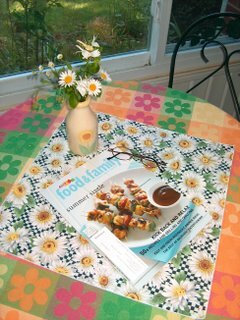 I found out about the free Kraft magzine from my friend Robin in her Fresh Cooking from the Garden blog. Be sure to check her out. She always has something good to share. I enjoy fixing her dishes to go along with my barbecue. I thought the Kraft mag would be a little booklet, but it's a full scale magazine. It comes out quarterly. Just go to Kraft and look under "Daily Dish." You can also find loads of recipes right there on the site and also can sign up for email if you like electronic info better than mail info. There are no strings with this wonderful freebie. I'm on my second quarterly issue. Kraft does email to let me know it's on the way, but they don't spam my box. I'm mightily impressed. I think you will be too.